Basic iPad Features: What Do You Get With an iPad? Apple releases a new iPad lineup each year, and while there are always a few key changes, mostly, the device stays the same. That is because mostly, the device is still an iPad. It may be faster, it may be slightly thinner and slightly faster, but is still mostly functions the same. Even the name tends the stay the same. Each new generation of iPad will bring a faster processor and faster graphics processing. The latest iPad Air 2 included a Tri-Core processor, making it one of the fastest mobile devices on the market, and an upgrade from 1 GB to 2 GB of RAM for applications. Most of the remaining features were the same as previous generations. The third-generation iPad introduced the 2,048x1,536 "Retina Display." The idea behind the Retina Display is that the pixels are so small at the average viewing distance that the individual pixels cannot be distinguished, which is a fancy way of saying the screen is as clear as it can possibly get to the human eye. The display is also capable of detecting and processing multiple touches to the surface, which means it can detect the difference between a single finger touching or swiping the surface and multiple fingers. The size of the display changes with the iPad model, with the iPad Mini measuring 7.9 inches diagonally with 326 pixels-per-inch (PPI) and the iPad Air measuring 9.7 inches with 264 PPI. The iPad Air introduced the motion co-processor, which is a processor dedicated to interpreting the various motion sensors included in the iPad. The iPad 2 introduced a back-facing camera and a front-facing camera designed specifically for FaceTime video conferencing. The back-facing iSight camera was upgraded from 5 MP to 8 MP quality with the iPad Air 2 and is capable of 1080p video. The amount of Flash storage can be configured based on the exact model. 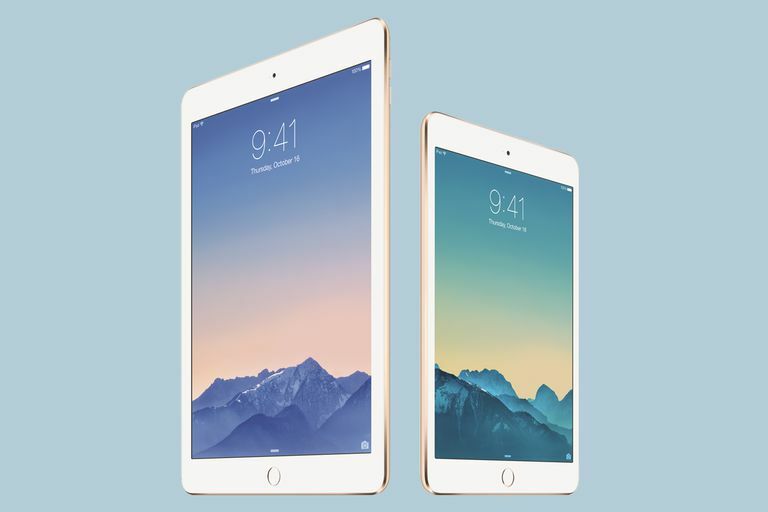 The newest iPad Air and iPad Mini come with either 16 GB, 64 GB or 128 GB of storage space. The iPad supports all Wi-Fi standards, with the iPad Air 2 adding the newest "ac" standard. This means it will support the fastest settings on the latest routers. Beginning with the iPad Air, the tablet also supports MIMO, which means multiple-in, multiple-out. This allows multiple antennas on the iPad to communicate with the router to deliver faster transfer speeds. Bluetooth technology is a wireless form of communication that allows secure data transfer between devices. It is how the iPad and iPhone send music to wireless headphones and speakers. It also allows wireless keyboards to connect to the iPad among other wireless devices. The "Cellular" models of the iPad allow you to use Verizon, AT&T or similar telecom companies to receive wireless Internet. The individual iPad must be compatible with the specific network, so in order to use AT&T, you must have an iPad compatible with AT&T's network. The cellular model of the iPad also includes an Assisted-GPS chip, which is used to get the precise location of the iPad. The Accelerometer inside the iPad measures movement, which allows the iPad to know if you are walking or running and even how far of a distance you have traveled. The Accelerometer also measures the angle of the device, but it is the Gyroscope that fine-tunes orientation. Finally, the compass can detect the direction of the iPad, so if you are in the Maps app, the compass can be used to orient the map to the direction your iPad is held. Among the many other sensors on the iPad is the ability to measure ambient light, which allows the iPad to adjust the brightness of the display based on the amount of light in the room. This helps produce a clearer display and save on battery power. Similar to the iPhone, the iPad has two microphones. The second microphone helps the iPad tune out "crowd noise," which is especially handy when using the iPad with FaceTime or using it as a phone. Apple replaced the 30-pin connector with the Lightning connector. This connector is both how the iPad is charged and how it communicates with some other devices, such as hooking it up to your PC to connect the iPad to iTunes. The iPad Air moved the external speaker to the bottom of the iPad, with one speaker to each side of the lightning connector. The iPad has been advertised as having around 10 hours of battery life since the original iPad debuted. The actual battery life will depend on how it is used, with watching video and using a 4G LTE connected to download from the Internet taking up more power than reading a book or browsing the web from your couch. Included in the Box: The iPad also comes with a Lightning cable, which can be used to connect the iPad to a PC, and an adapter to plug the Lightning cable into a wall outlet. ​Perhaps the biggest reason why many people buy an iPad isn't a feature on the iPad itself. While Android has done a good job catching up to the iPad in the app department, the iPad is still the market leader, with more exclusive apps and many apps coming to the iPad and iPhone months before they come to Android.